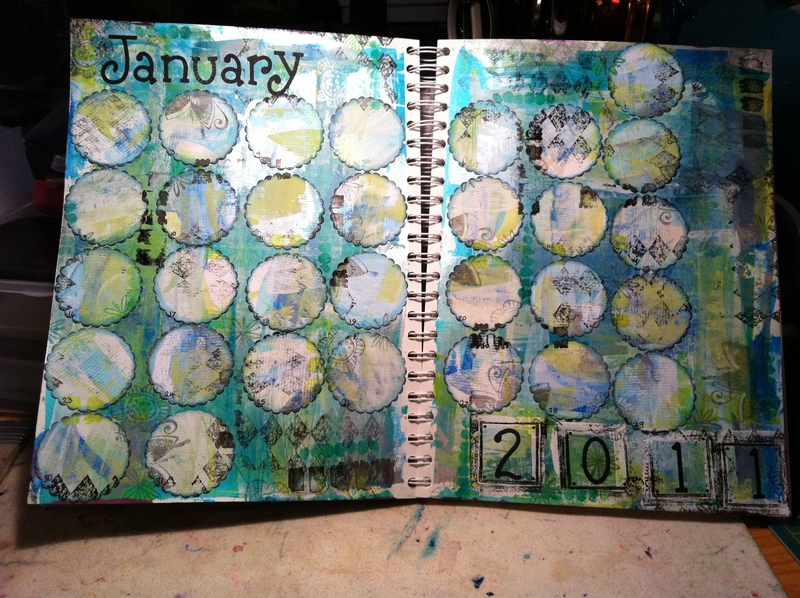 These are the finished art journalling diary pages. I used a punch for the scalloped circles of fairly stiff watercolour type card. It was actually a DIY calendar for 2009 that I failed to have ready for Christmas presents. Whoops! I did the same acrylic paint scrapping technique to create my journalling spots as I did for the background and after punching them out I distress inked them with Blue China & Black Soot distress inks. I cut the letters out with my trusty Cuttlebug, and Sizzix “Bang! Zoom” alphabet. To finish off I used rubber stamps with acrylic paint (wash straight away to get paint off or it sets solid), pigment ink in shades of green and Versafine ink in black and grey. I’m really pleased with how it looks, lovely and grungy and the reflective quality of the acrylic paints gives the pages flashes of light. I’m going to write in a permanent ink on top of the paint, but I think I’ll use a green or blue shade as a black marker will be lost where I have stamped in black. Have a yen to write in a spiral, should I turn the page or swivel in my office chair?